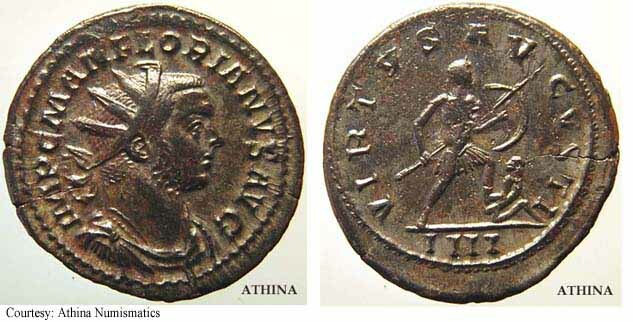 276 Florian was the half-brother of Tacitus who became ever-so-briefly the sole Senate-ratified emperor. 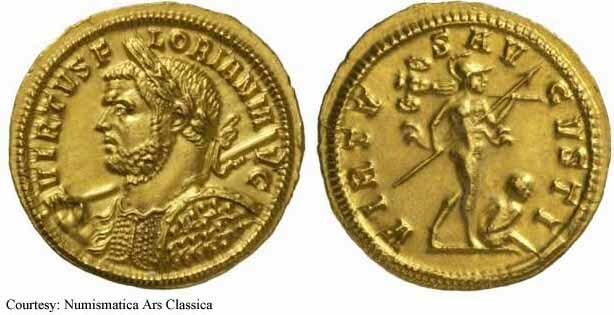 While Tacitus was still alive, he sent Florian with a large army off to confront Probus, self-proclaimed emperor. Probus outsmarted Florian on the battlefield and emerged triumphant. Together with Florian's former army, Probus then resumed his march towards Rome. 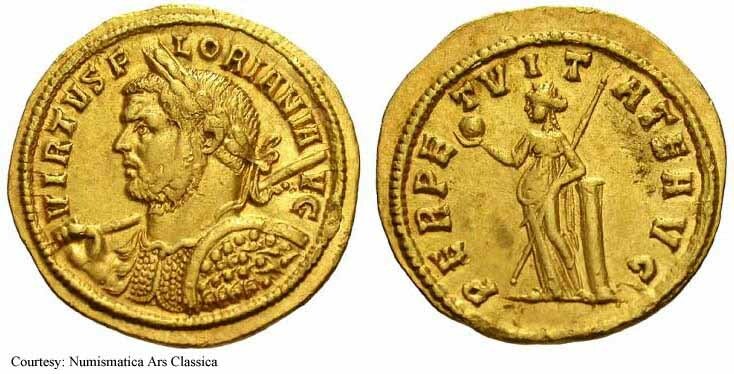 RIC 21, CalicСѓ 4131, C 55 Aureus Obv: VIRTVSFLORIANIAVG - Laureate, cuirassed bust left, holding spear over shoulder and shield. Rev: PERPETVITATEAVG - Providentia standing left, leaning on column, holding globe and cradling scepter. June - August 276 (Ticinum). 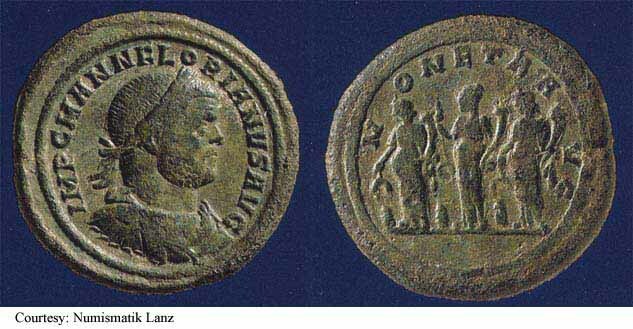 RIC 24, CalicСѓ 4135, Estiot 6a, C 106 Aureus Obv: VIRTVSFLORIANIAVG - Laureate, cuirassed bust left, holding spear over shoulder and shield. Rev: VIRTVSAVGVSTI - Mars advancing right, holding spear and trophy; seated captive to right. June - August 276 (Ticinum). $40,739 12/5/02. 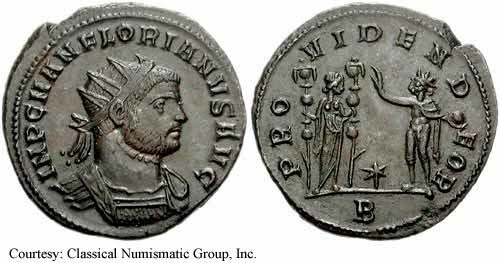 RIC 10c, Estiot 2646, Bastien 148 Antoninianus Obv: IMPCMANFLORIANVSAVG - Radiate, draped and cuirassed bust right. Rev: PROVIDENTIAAVG - Providentia standing left, holding wand over globe and scepter. 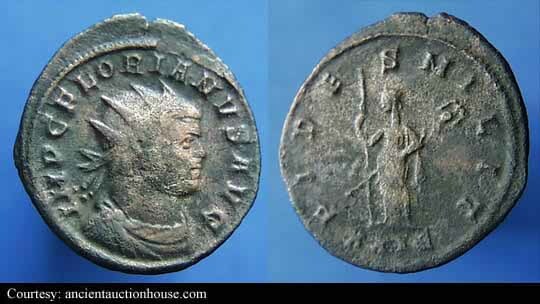 RIC 16c, Estiot 2654 Antoninianus Obv: IMPCMANFLORIANVSAVG - Radiate, draped and cuirassed bust right. Rev: VIRTVSAVGVSTI Exe: IIII - Florian advancing right, stepping on captive, holding spear and shield. 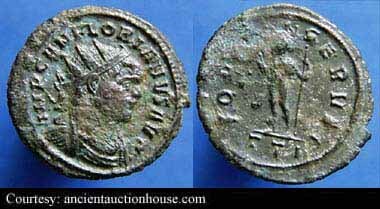 RIC 25c, Estiot 2504, C 1 Antoninianus Obv: IMPCFLORIANVSAVG - Radiate, draped and cuirassed bust right. Rev: AEQVITASAVG - Aequitas standing left, holding scales and cornucopia. 276 (Rome). $37 1/4/03. 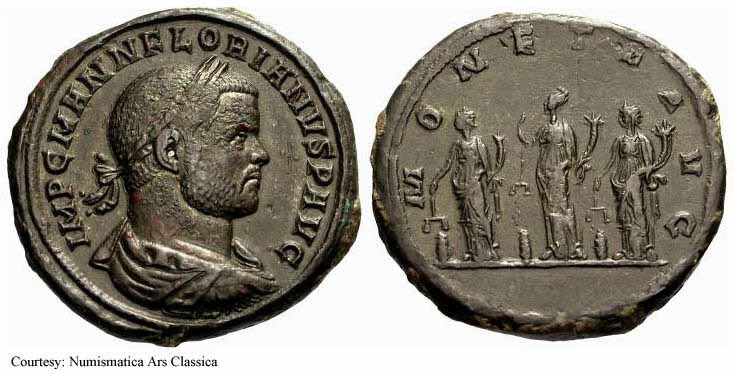 RIC 30c, C 25 Antoninianus Obv: IMPCFLORIANVSAVG - Radiate, draped and cuirassed bust right. Rev: FIDESMILIT - Fides standing left, holding scepter and standard. 276 (Rome). $24 12/27/02. RIC 37c, Estiot 2441 Antoninianus Obv: IMPCMANFLORIANVSAVG - Radiate, draped bust right. Rev: PROVIDENTIAAVG - Providentia standing left, holding wand over globe amd cornucopia. $79 4/14/04. RIC 40a, C 83 Antoninianus Obv: IMPCFLORIANVSAVG - Radiate, draped bust right. Rev: SALVSAVG - Salus standing left, feeding snake on altar and holding scepter. $27 1/26/02. 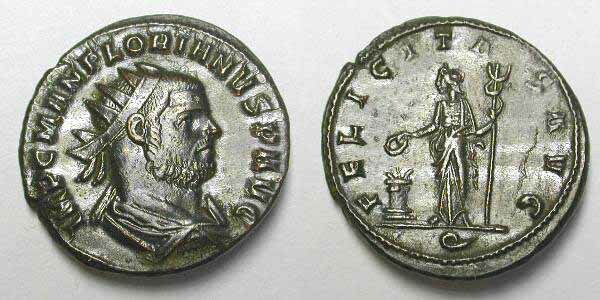 RIC 47c, C 97 Antoninianus Obv: IMPCFLORIANVSAVG - Radiate, draped and cuirassed bust right. Rev: VIRTVSAVG - Florian standing right, holding spear and globe. June - August 276 (Rome). 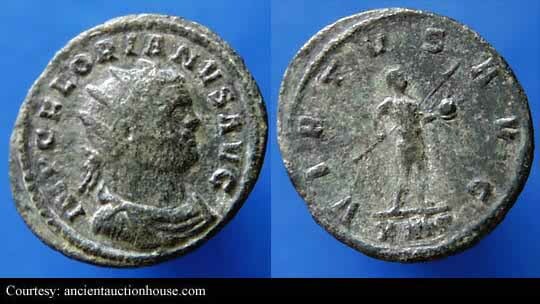 RIC 61c Antoninianus Obv: IMPCMANFLORIANVSPFAVG - Radiate, draped and cuirassed bust right. Rev: FELICITASAVG - Felicitas standing left, sacrificing over altar and holding caduceus. 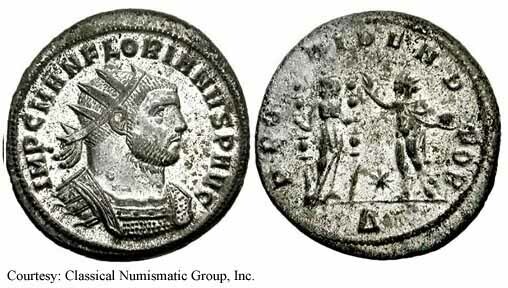 RIC 62f, C 32 Antoninianus Obv: IMPCMANFLORIANVSPAVG - Radiate, cuirassed bust right. Rev: FELICITASSAECVLI - Felicitas standing left, sacrificing over altar and holding caduceus. June - August 276 (Ticinum). 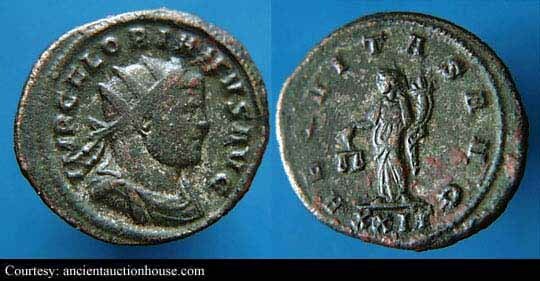 RIC 71, C 32 Antoninianus Obv: IMPCANFLORIANVSAVG - Radiate, draped and cuirassed bust right. Rev: IOVICONSERVAT - Jupiter standing left, holding thunderbolt and scepter. $27 7/19/02. 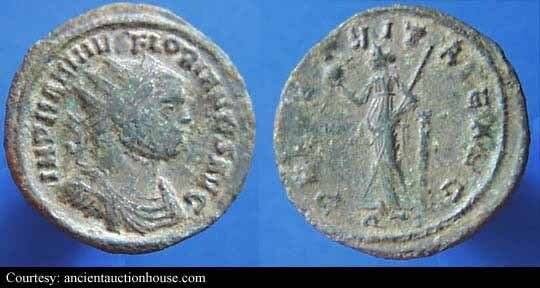 RIC 77 Antoninianus Obv: IMPMANNIVSFLORIANVSAVG - Radiate, draped and cuirassed bust right. Rev: PERPETVITATEAVG - Securitas standing left, leaning on column, holding globe and scepter. $27 2/15/02. RIC 111f, C 71 Antoninianus Obv: IMPCMANNFLORIANVSAVG - Radiate, cuirassed bust right. Rev: PROVIDENDEOR - Providentia standing on left, holding two standards, facing Sol to right, raising hand and holding globe. June - August 276 (Serdica). $79 7/11/04. 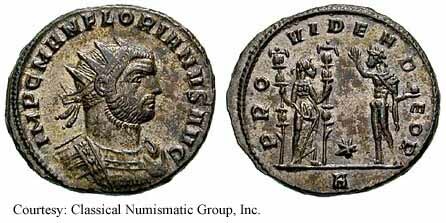 RIC 112c, C 72 Antoninianus Obv: IMPCMANFLORIANVSAVG - Radiate, draped and cuirassed bust right. Rev: PROVIDENDEOR - Providentia standing on left, holding two standards, facing Sol to right, raising hand and holding globe. June - August 276 (Serdica). $21 1/24/03. RIC 112f, C 72 Antoninianus Obv: IMPCMANFLORIANVSAVG - Radiate, cuirassed bust right. Rev: PROVIDENDEOR - Providentia standing on left, holding two standards, facing Sol to right, raising hand and holding globe. June - August 276 (Serdica). $165 7/1/04. 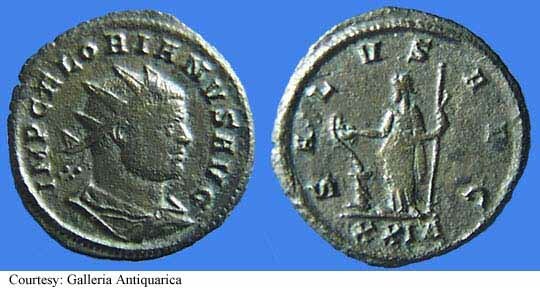 RIC 116c, C 15 Antoninianus Obv: IMPFLORIANVSAVG - Radiate, draped and cuirassed bust right. Rev: CONCORDIAMILITVM - Florian standing left on right, raising hand and holding scepter, being crowned with wreath by Victory on left, holding palm. June - August 276 (Cyzicus). 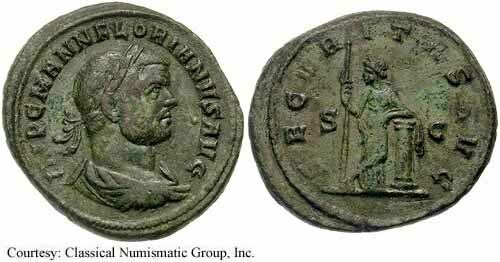 Unlisted RIC, Estiot 2932 Antoninianus Obv: IMPCMANFLORIANVSAVG - Radiate, cuirassed bust right. Rev: PROVIDENDEOR - Providentia standing right on left, holding two standards, facing Sol to right, raising hand and holding globe. Estiot 2919 Antoninianus Obv: IMPCMANFLORIANVSPAVG - Radiate, cuirassed bust right. Rev: PROVIDENDEOR Exe: /KAО” - Providentia standing right on left, holding two standards, facing Sol to right, raising hand and holding globe. Estiot 2933 Antoninianus Obv: IMPCMANFLORIANVSPAVG - Radiate, cuirassed bust right. Rev: PROVIDENDEOR Exe: /О” - Providentia standing right on left, holding two standards, facing Sol to right, raising hand and holding globe. 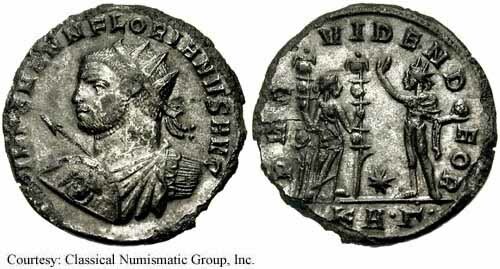 Unlisted Antoninianus Obv: IMPCMANNIVSFLORIANVSAVG - Radiate, draped and cuirassed bust right. Rev: FIDESMILITVM Exe: KA - Fides standing, facing, holding standard in each hand. 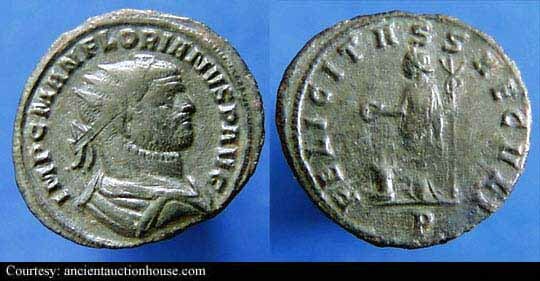 Unlisted Antoninianus Obv: IMPMANFLORIANVSPAVG - Radiate, draped and cuirassed bust right. Rev: SECVRITASSAECVLI Exe: XXIQ - Securitas seated left, holding scepter and resting head on hand. $77 5/11/04. 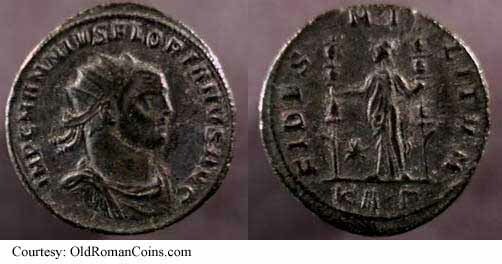 Unlisted Antoninianus Obv: IMPCMANNIVSFLORIANVSAVG - Radiate, draped and cuirassed bust left, holding spear and shield. Rev: PROVIDENDEOR Exe: /KAвЂў вЂў - Providentia standing on left, holding standard in each hand, facing Sol to right, raising hand and holding globe. $1,000 9/24/03. RIC 178, Gnecchi 3, C 43 Bronze Medallion Obv: IMPCMANNFLORIANVSAVG - Laureate, draped and cuirassed bust right. Rev: MONETAAVG - Three Monetae standing left, holding scales and cornucopia. Unlisted RIC, Gnecchi 2 Bronze Medallion Obv: IMPCMANNFLORIANVSAVG - Laureate, draped and cuirassed bust right. RIC 53, C 85 As Obv: IMPCMANNFLORIANVSAVG - Laureate, draped and cuirassed bust right. Rev: SECVRITASAVG - Securitas standing left, leaning on column and with legs crossed, holding scepter. 276 (Rome). $2,500 5/21/03.